Fun at the Hunt Museum Limerick. A budding city planner, perhaps? 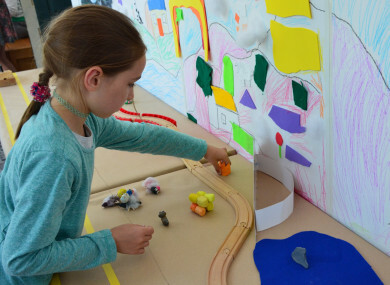 ArKIDtechture workshop at the Hunt Museum: As a part of Open House Limerick, the Hunt Museum is hosting an architecture workshop for children this Saturday, where kids will design a brand new city, with Sean Logan from The School of Architecture at the University of Limerick. Suits: 5+. When: 11am-1pm. Costs: Free, but booking is essential. Find out more here. Story Time At The National Gallery: Take a seat in one of Ireland’s oldest galleries as storyteller Ruth Concannon gets ready to tell tall tales of Halloween this Saturday at the National Gallery gift shop. Fancy dress is encouraged, as is a wander around the gallery’s current exhibits afterward. Suits: 3-10 years – but an adult must be in attendance. When: Sat October 20, 11.30am – 12.30pm. Costs: Free. Find out more here. Animation Art Show: This family friendly exhibition includes an auction of artwork like a print from Song Of The Sea and production artwork from Care Bears, Thumbelina and All Dogs Go To Heaven. All proceeds go to Irish children’s charities. Artwork will be on display from Sat October 27, with the auction taking place the following Saturday November 4. Suits: The whole family. When: Sat October 27th – Sat November 4. Costs: Free. Find out more here. Have a free day out at IMMA: The Irish Museum of Modern Art is a playground for art lovers of all ages. To entice small fans through their doors, the museum offers a free family pack, which includes games, puzzles and tasks designed to encourage children to explore the galleries – and respond to their experience through writing, drawing and colouring. Suits: The whole family. When: All year round. Costs: Free. Find out more here. Live art in Galway: As a part of Baboro, the International Arts Festival for Children, illustrators Niamh Sharkey, Tarsila Krüse and PJ Lynch will be making wall-sized pictures this Friday October 19 at The Wonder Works on Market Street, and they want families to come along to help them out. Suits: The whole family. When: Fri October 19, 3.30pm and 5.30pm. Costs: Free, but places are limited and allocated on a first come, first served basis. Find out more here. Sunday Funday at Crawford Art Gallery: Every Sunday is Family Day at Cork’s Crawford Art Gallery, with free gallery tours at 2pm, free art workshops and a monthly calendar of concerts and storytelling. Suits: all ages. When: 11am-4pm each Sunday. Costs: Free. Find out more here. Email “6 events coming up this month for kids who love arts and crafts”. Feedback on “6 events coming up this month for kids who love arts and crafts”.